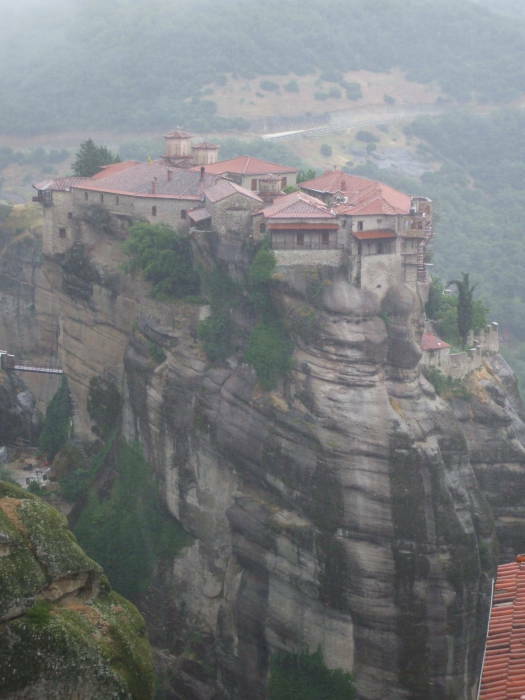 Meteora (or Μετέωρα) is a large complex of Greek Orthodox monasteries in a beautiful setting in north-central Greece. Six monasteries founded at dates back to the late 11th centuries are built on top of sandstone pinnacles at elevations up to 550 meters above the valley floor. Μετέωρα is Greek for "Suspended in the air", from the same root as air-related terms meteor and meteorology. 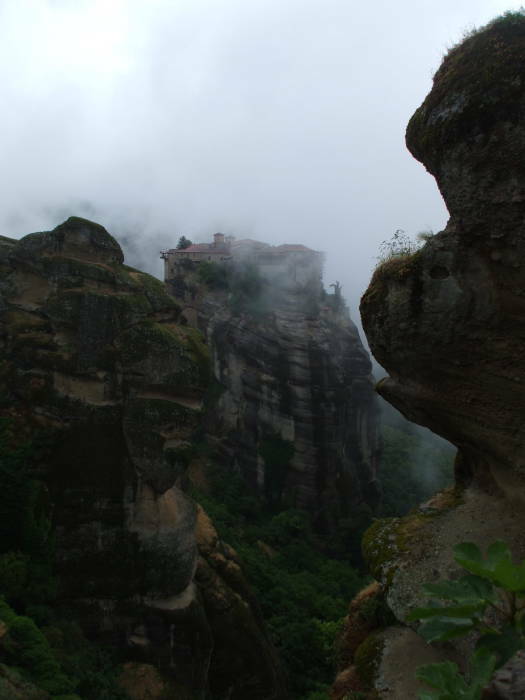 Greek Orthodox monasteries of Agiou Nikolaou Anapafsa and Agias Varvaras Rousanou in Meteora. The formations go back to about 60 million years ago, when a mixture of sandstone and conglomerate formed during the Teriary Period. A series of plate movements raised the seabed, creating a high plateau with many fault lines. Weathering by water and wind formed their present shape. Caves in the area were inhabited 50,000 years ago. The Theopetra cave has yielded remains of of human occupation radiocarbon dated to that Middle Paleolithic period. Herodotus wrote in the 400s BC that the local people maintained a belief that the Thessaly plain had once been submerged under a sea. If there really is anything to that, it would refer to an inundation around 8000 BC at the end of the last Late Glacial Maximum. An ascetic group of Christian monks moved into the area in the 800s CE, establishing hermitages in the hollows in the rock faces. Their goal was solitude, enforced ther locations in the high cliff faces. A monastic state calling itself the Skete of Stagoi had been established by the late 1000s and early 1100s. The ascetic community had boomed by the late 1100s, when a church called the Panaghia Doupiani or Skete had been built where monks had taken up residence at the foot of one of the "heavenly columns." Large monasteries were constructed starting in the early and mid 1300s. Athanasios Koinovitis came from Mount Athos in 1344 with a large group of followers. 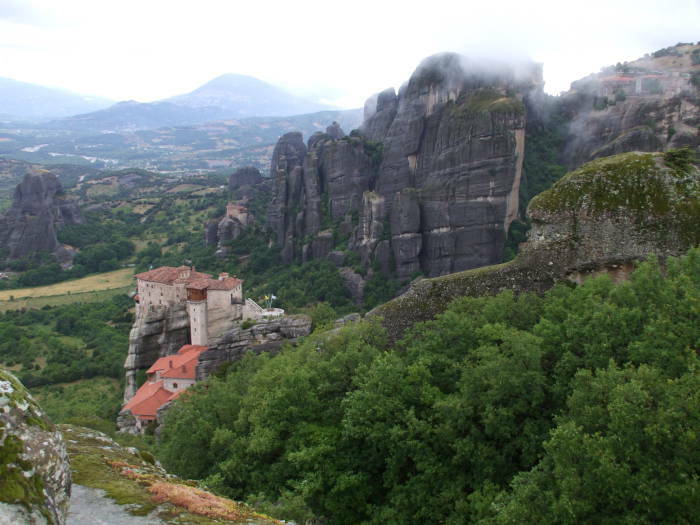 They built Moni Megalou Meteorou in 1356-1372 on top of a tall rock pinnacle. 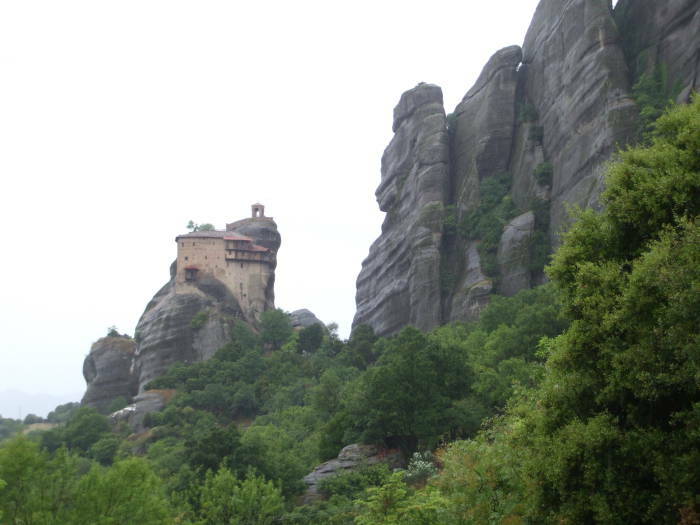 The other large monasteries that followed were built on top of other rock towers. Athanasios' was succeeded by Iosaph, formerly Jovan Uroš (or Јован Урош), the Serbian emperor and ruler of Thessaly turned monk. He gave up his worldly position in 1373 and came to Megalou Meteorou. He rebuilt the main church in 1387-1388 and added monastic buildings to the complex. Access was extremely limited. 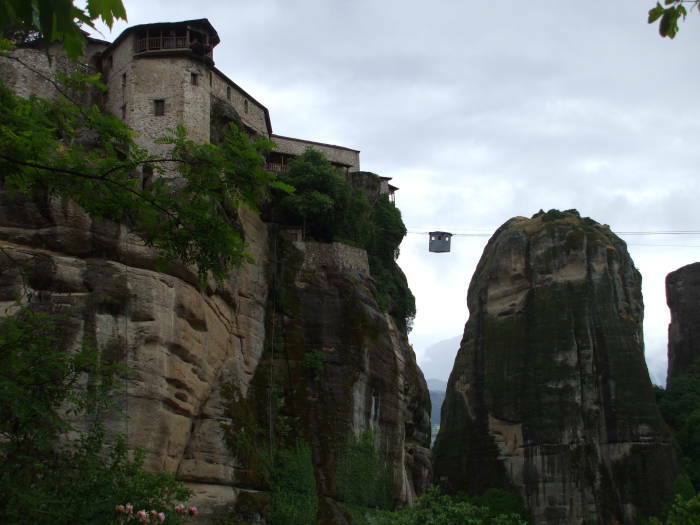 The monasteries could only be reached by climbing rope ladders or by being hoisted in a rope net. 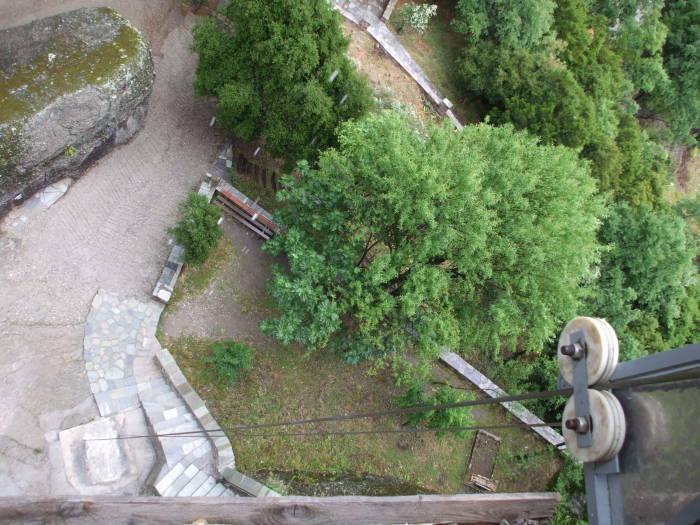 The ropes and ladders could be pulled up to cut the monasteries off from the outside world. When asked when the ropes were replaced, the monks famously replied "When the Lord lets them break." The Byzantine Empire had controlled northern Greece for centuries, but the Ottoman Turks started encroaching on the area toward the end of the 1300s. The growing threat drove further monastery construction. Twenty-four were built by the end of the 1400s, of which six survive today. Map of Greece showing the location of Meteora. There is bus and train service to Kalampaka, also transliterated into the Latin alphabet as Kalabaka, spelled in Greek as Παλαμπακα. From there it's a walk of a kilometer or two into the village of Kastraki, and then a long uphill trek or a bus ride to the monasteries. See the below section on logistics for details on how to get there. 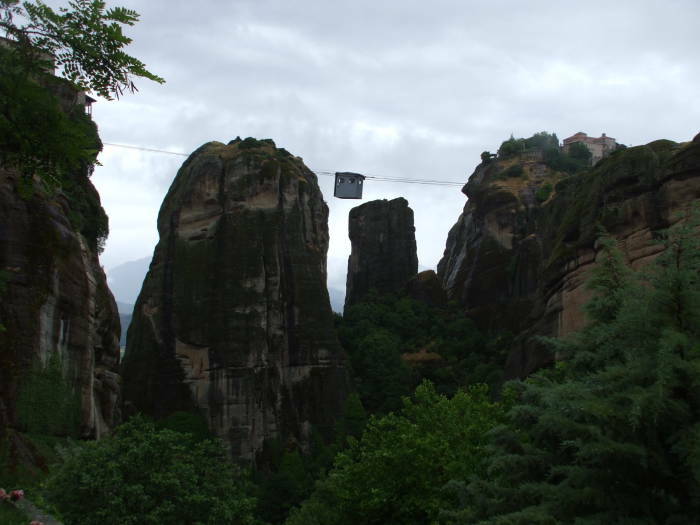 I think that the best way to visit Meteora is to take the occasional bus all the way up to the top and Moni Megalou Meteorou, and then walk down while visiting the Meteora monasteries along the way. Yes, you could walk all the way up and then back down again, but you would be pretty tired by the end of that and you might not get much out of your visits. You are looking at an elevation gain of about 550 meters from the village to the top, and then the same descent back down again. 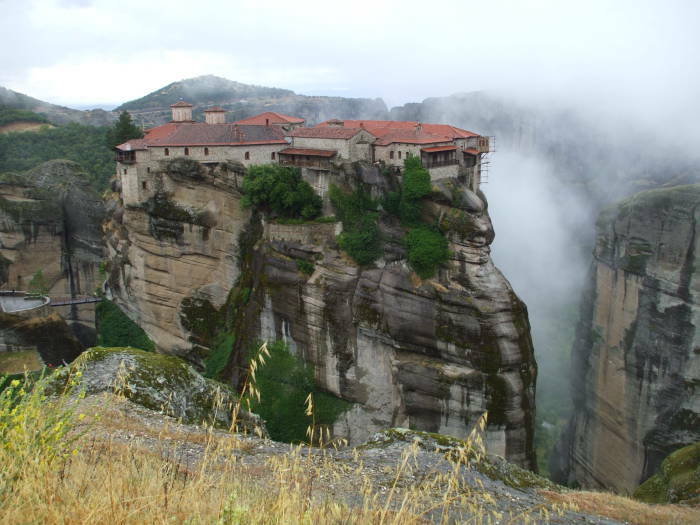 The monastery Moni Megalou Meteorou is the largest monastery at Meteora. It was built in the mid 1300s, and restored in 1483 and 1552. Its main church, the Katholikon, is consecrated to the Transfiguration of Jesus. The monasteries are uniform in their prohibition of photography. So, I have pictures of their exteriors only. The Katholikon of Moni Megalou Meteorou has three main chambers common to Orthodox church architecture: a narthex, a nave, and a sanctuary. The narthex is designed to function as the connection between the Church (within the nave) and the outside world (outside the entire structure). The narthex of Moni Megalou Meteorou, as common at Meteora, is covered in artwork depicting a martyrological catalog of gruesomeness beyond the most feverish dreams of Quentin Tarantino and Robert Rodriguez. Death by fire (baking, flame-grilling, and boiling), cutting and sawing in various planes, crushing, drawing and quartering, dismemberments of all varieties, and worse. The nave is the temple proper, its name coming from the same root as naval, functioning as a "ship of souls", its keel shaped vaulting in western churches further emphasizing that terminology. As in all Orthodox churches, there are no pews and few seats except for a few around the perimeter. Overhead in the dome above the center of the nave is a painting of Christ Pantocrator or Χρίστος Παντοκράτορ, Christ the Ruler of all of creation. Greek Orthodox monastery Moni Megalou Meteorou. 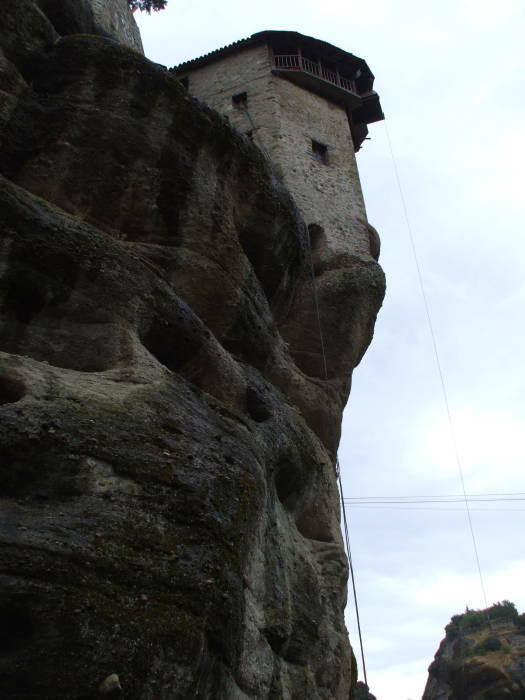 The six surviving monasteries are all on tall pinnacles with sheer faces. The only access in the past was to climb rope ladders or to be hoisted in a rope net. 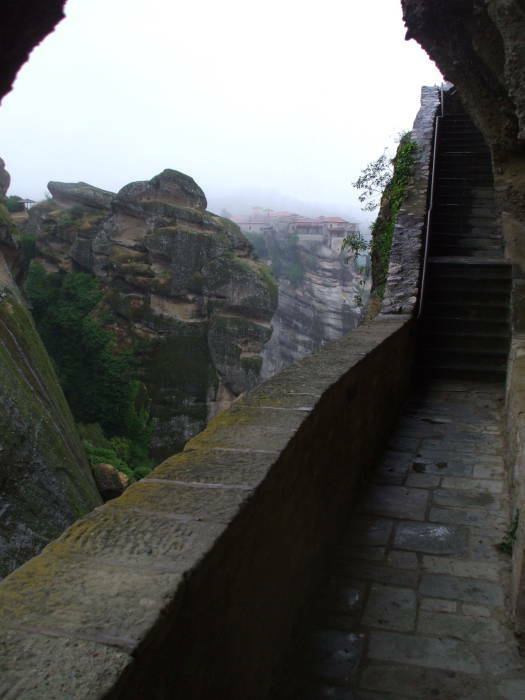 Now there is a steep stairway descending the side of the top plateau, a narrow stone bridge across the chasm, and a series of paths and stairways up the face of the monastery's pillar. 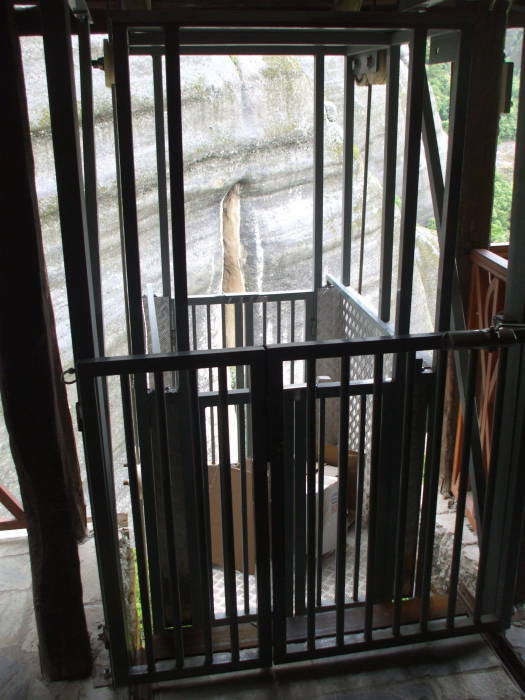 A set of steel cables crosses the chasm, carrying a small cable car used by visiting priests who want to use this relatively traditional means of arrival. Cliff face path to Moni Megalou Meteorou. Moni Varlaam is visible in the distance. Greek Orthodox priest arrives at Moni Megalou Meteorou in a small cable car. 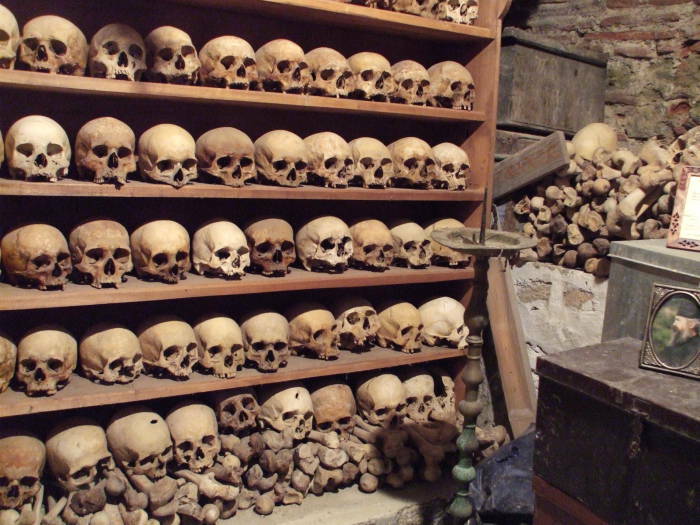 An ossuary near the entrance of Moni Megalou Meteorou stores the skulls and some major bones of monks who served there. The monastery complex includes a museum that illustrates how Greek identity thoroughly mixes Greek Orthodoxy with Greek nationalism. We're heading back down the cliff face stairs from Moni Megalou Meteorou, to cross the stone bridge and ascend back up to the main plateau. 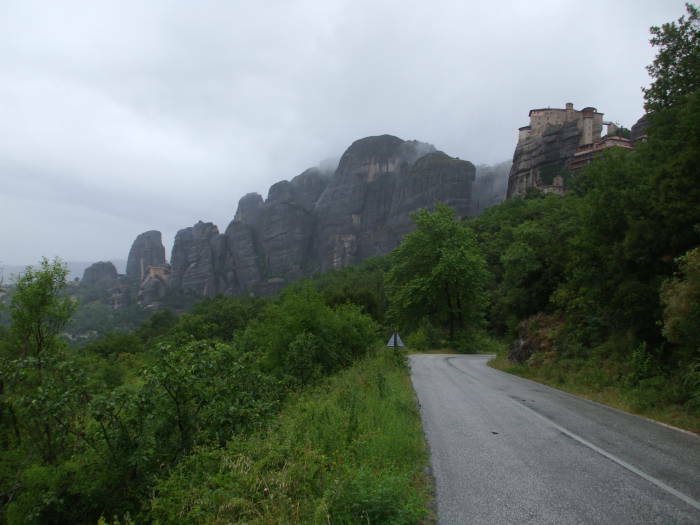 Then we will walk down the road toward Moni Varlaam, visible ahead through the clouds passing through upper Meteora. Moni Varlaam visible through the clouds. 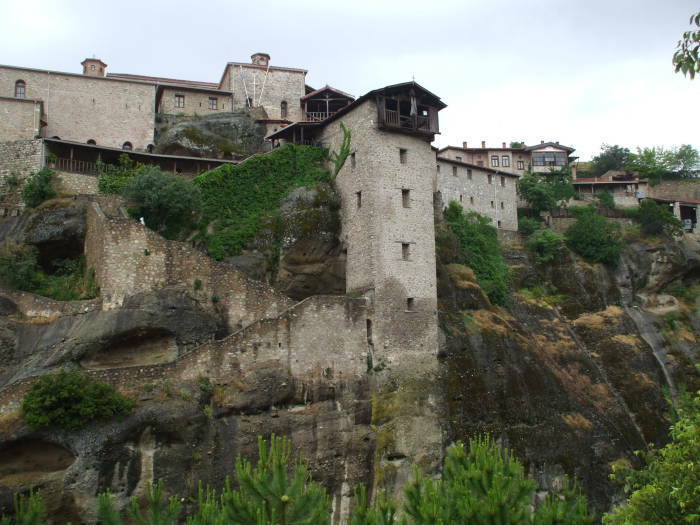 The Varlaam monastery was founded in 1517 by the brothers Nectarios and Theophanes. Its buildings were built in 1541. It was reputed to hold the finger of Saint John and the shoulder blade of Saint Andrew. No skull, but Andrew's skulls are otherwise well distributed around Europe. 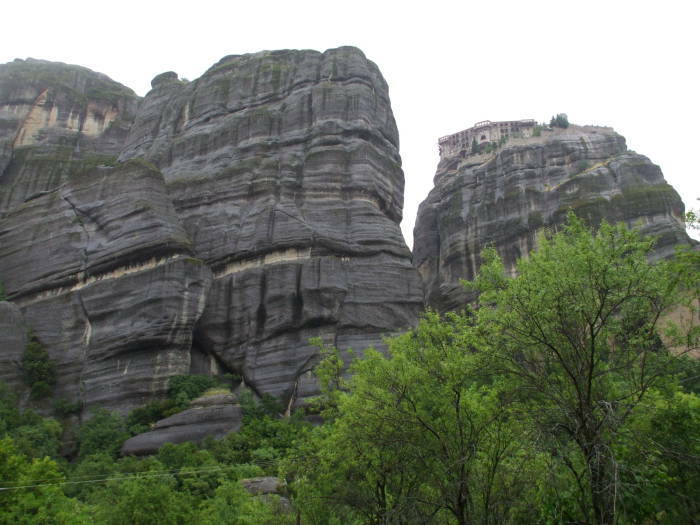 Moni Varlaam is the second largest Meteora complex. Like all the monasteries, it is open for visitors but possibly at idiosyncratic times. Ask for details at the place you are staying to best plan your visit. Whatever times and days you visit, all monasteries share a strictly enforced dress code (long trousers for men and long skirts for women), and entry fees of two Euros at each monastery. 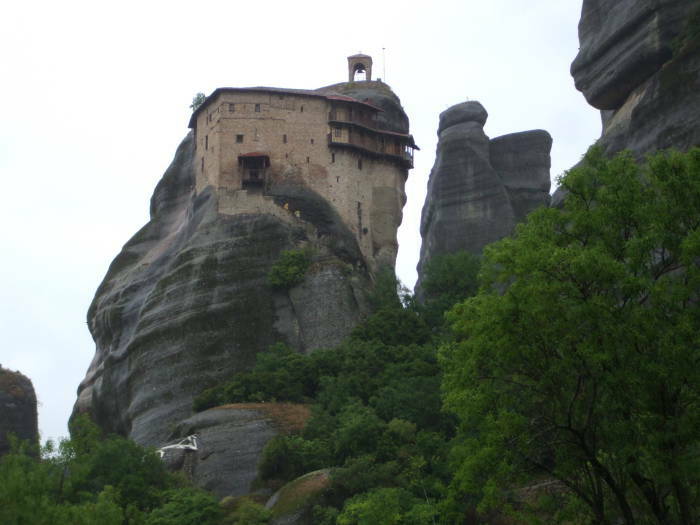 Greek Orthodox monastery Moni Varlaam in Meteora. The cliffs leading to Moni Varlaam are 373 meters high. Back in the day, access was limited to the hand-cranked monk-powered rope hoist. Steps were first carved into the face of its pinnacle in the early 1800s, and have been modified several times since then. 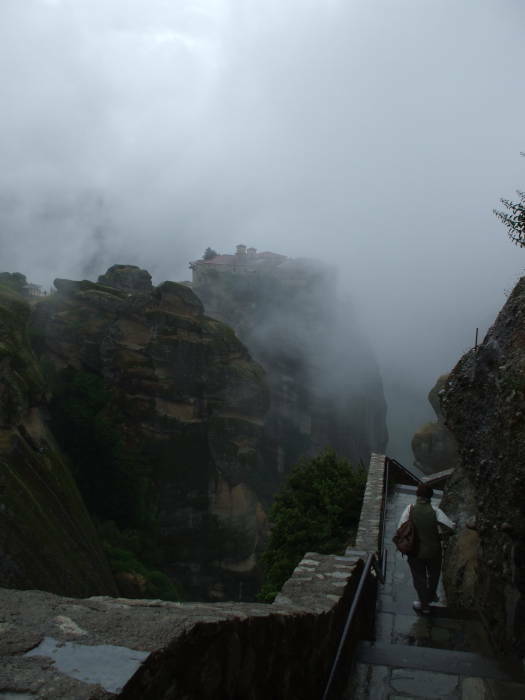 A narrow bridge now links those stairs to the main plateau above Meteora. Moni Varlaam is named for its founder, a monk named Varlaam or Barlaam. His name was Βαρλάαμ and the Β is pronounced as B or V depending on context and speaker. Apparently Varlaam was a typically ascetic 14th century monk who climbed this pinnacle and settled on its top in 1350. He built a cell for himself, a water tank, and three churches. The problem was that no one climbed up and took over Varlaam's post after his death, and the site was abandoned until 1517. 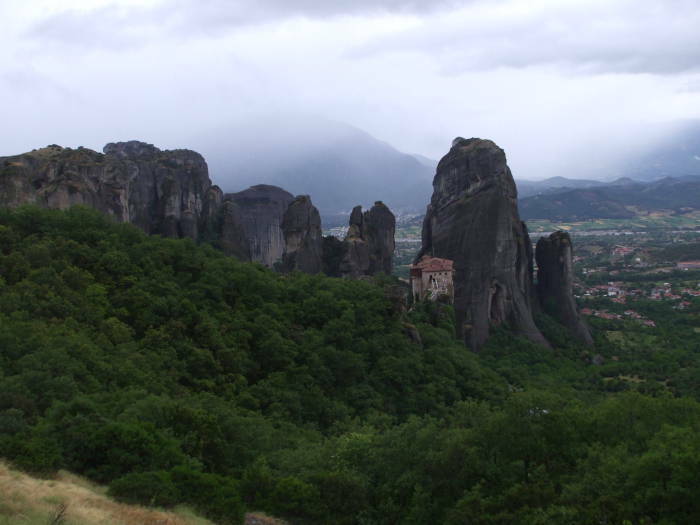 In that year Nectarios and Theophanes climbed the pinnacle and founded the current monastery. Moni Varlaam atop its pinnacle in Meteora. They renovated Varlaam's Church of the Three Hierarches and built a katholikon dedicated to All Saints and a tower. 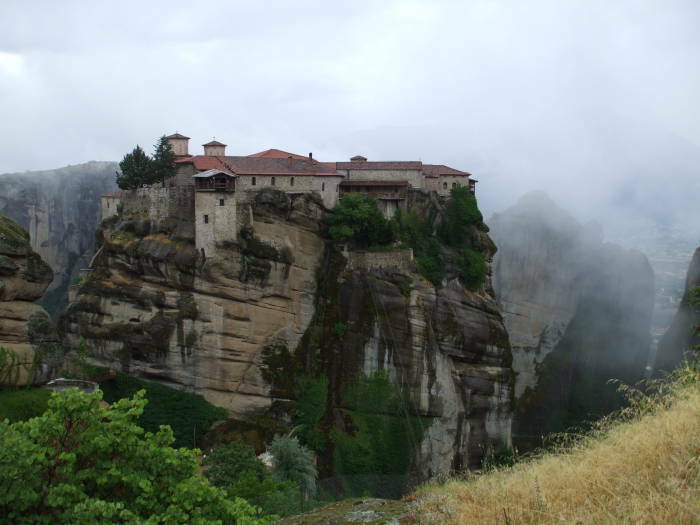 The monastery, like all those of Meteora, began to decline through the 1600s. Today just seven monks occupy Varlaam. 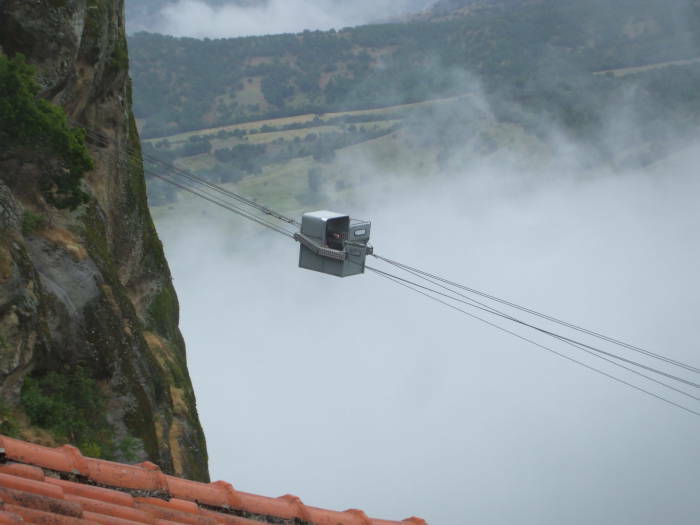 The small cable car carries a priest aboard Moni Varlaam. Meanwhile, we are walking along the footpath to the stone bridge across the chasm. Small cable car carries a priest to Moni Varlaam. The cable car approaches its destination. 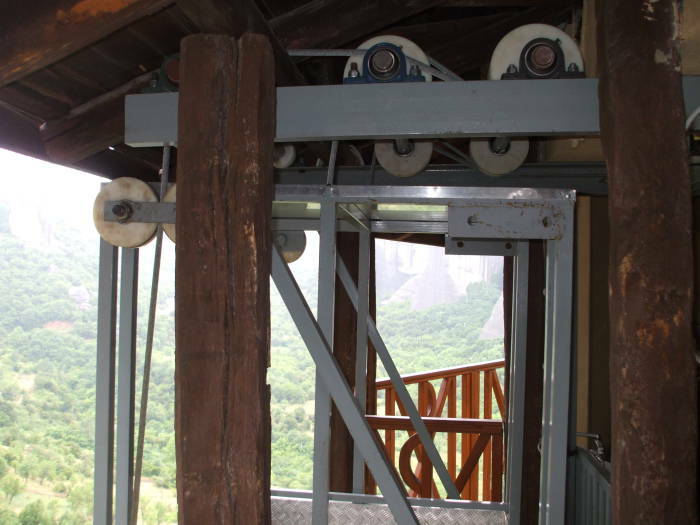 The hoist is still in place and used in Moni Varlaam, It would be far easier to load supplies into the rope net than it would be to carry them up the narrow stairs. Now it's electrically powered and uses a steel rope. Rope hoist still in place on Moni Varlaam. We are continuing down after visiting Moni Varlaam. 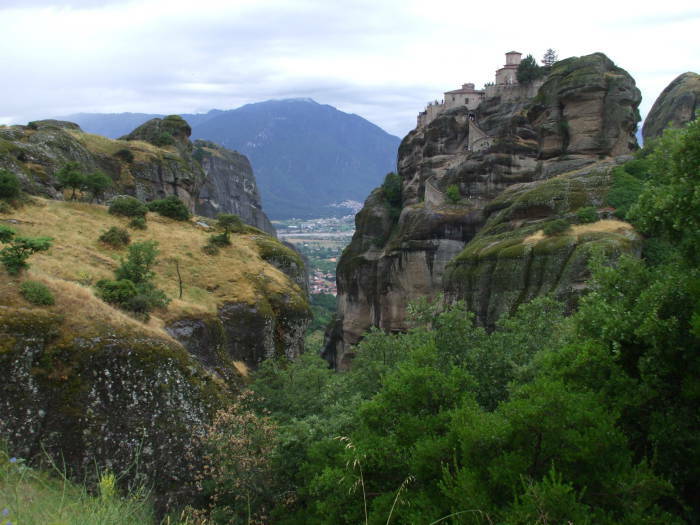 This view shows the monastery on its rock pinnacle, and an opening between rock columns to the valley floor beyond. Looking up from near the lowest monastery, we see just how high Moni Varlaam is, and how sheer are the faces of its rock pinnacle. Moni Varlaam as seen from below. 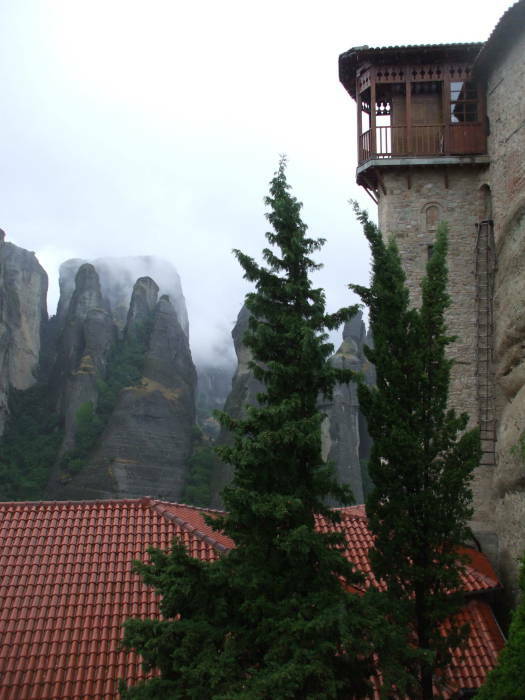 Greek Orthodox monastery Moni Agias Varvaras Rousanou in Meteora. The next monastery on our descent is Moni Agias Varvaras Rousanou. It was built in the mid 1500s. It is inhabited by nuns. That B-vs-V comes up again. Is it named for Saint Varvara or Saint Barbara? It depends on how you choose to transliterate her Greek name into the Latin alphabet. This monastery was founded around 1545, but it soon started declining and was subject to Moni Varlaam by 1614. It fell into disrepair from the early 1700s until the 1940s, when the Germans damaged and plundered it. It was restored by the regional archaeological service after World War II, and in 1988 a small community of 13 nuns moved in. 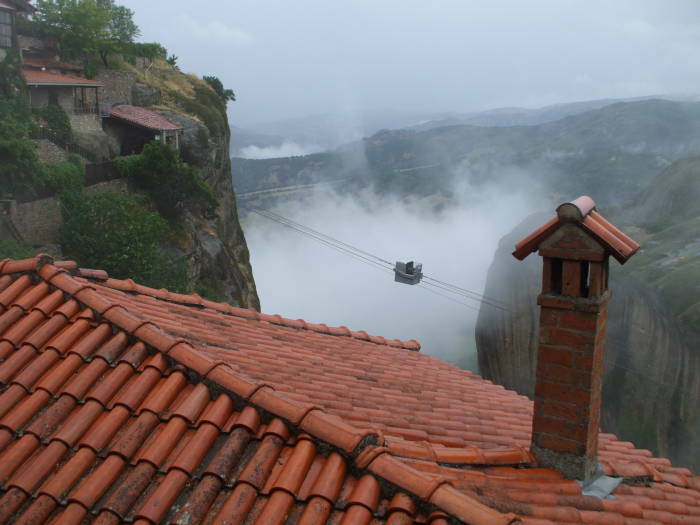 In the first picture we are looking down on Moni Agias Varvaras Rousanou. Beyond that and further down toward the valley floor is Moni Agiou Nikolaou Anapafsa. We are crossing the bridge to Moni Agias Varvaras Rousanou. Moni Agias Varvaras Rousanou looms overhead as we continue down the road toward the valley. Moni Agias Varvaras Rousanou is larger than it appears from above. 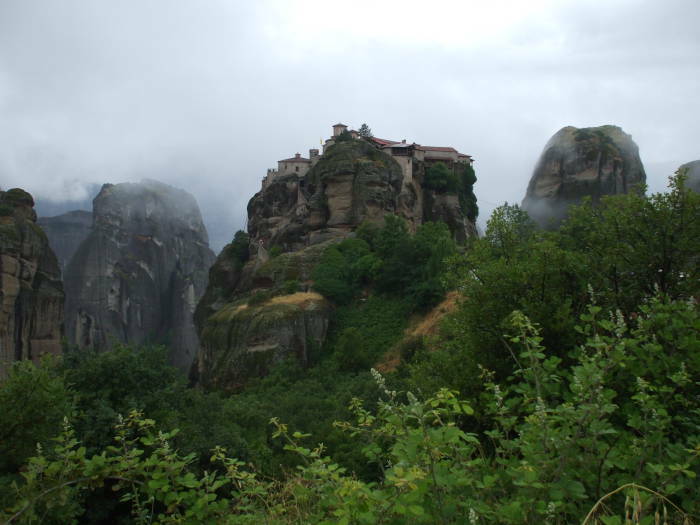 Moni Agiou Nikolaou Anapafsa is the lowest monastery in Meteora, although "lowest" is a relative term here. The site was occupied by hermits since the early 1300s, but the current monastery was founded in 1510 by Saint Dionysius, the Metropolitan of Larissa, and Nikanoras, the exarch of Stagoi. The complex you see today was built in the 1500s. The monastery declined through the 1700s and 1800s. It was abandoned by 1900, and its condition worsened until its restoration in the 1960s by the archaeological service. Father Palamas then occupied the monastery, until 1982. The monastery closed again. The priests from Kalampaka started opening the monastery to visitors in the summer months starting in 1997. Now just one monk lives there, Polykarpos Venetis, the abbot archimandrite. 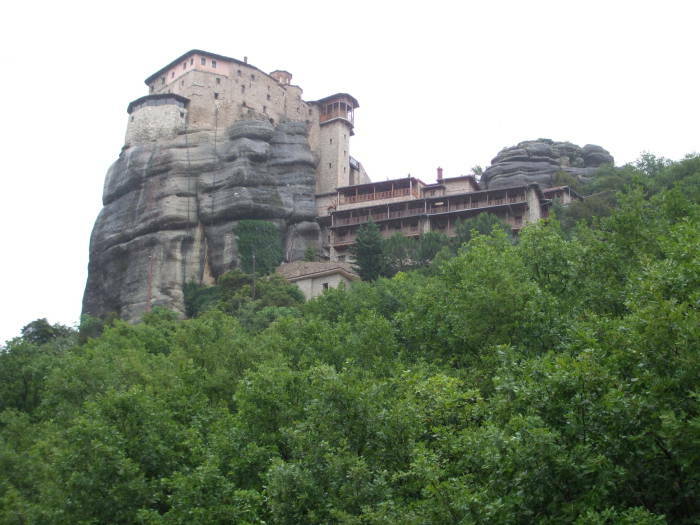 Greek Orthodox monastery Moni Agiou Nikolaou Anapafsa in Meteora. Of course we will have to climb back up to visit Moni Agiou Nikolaou Anapafsa. 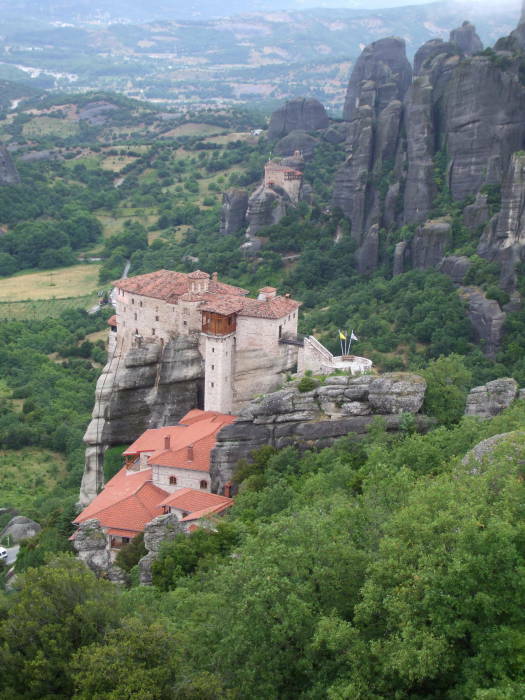 You get a workout when you visit Meteora. Its rock pinnacle is relatively small, driving the construction upward. There are three levels of structures in the monastic complex. The frescoes at Moni Agiou Nikolaou Anapafsa are especially significant, as they were painted in 1527 by Theophanes Strelitzas, the famous leader of the Cretan school of painting. I found them especially nice as they were not as obsessed with gruesome martyrdom as those at the other monasteries. 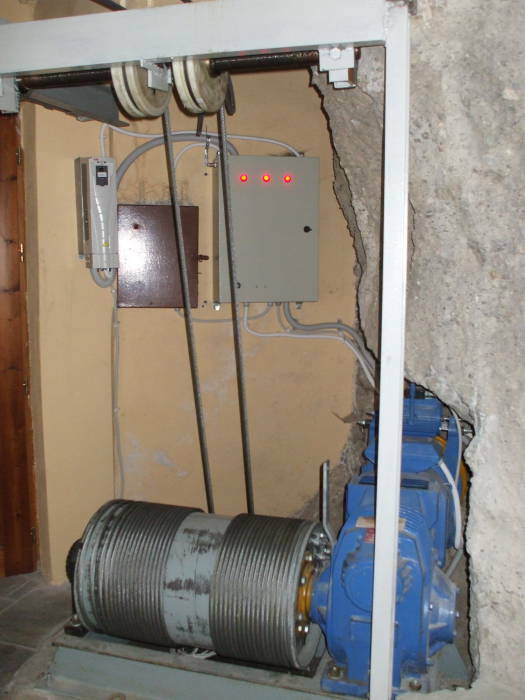 This is the modern elevator hoist motor at Moni Agiou Nikolaou Anapafsa. 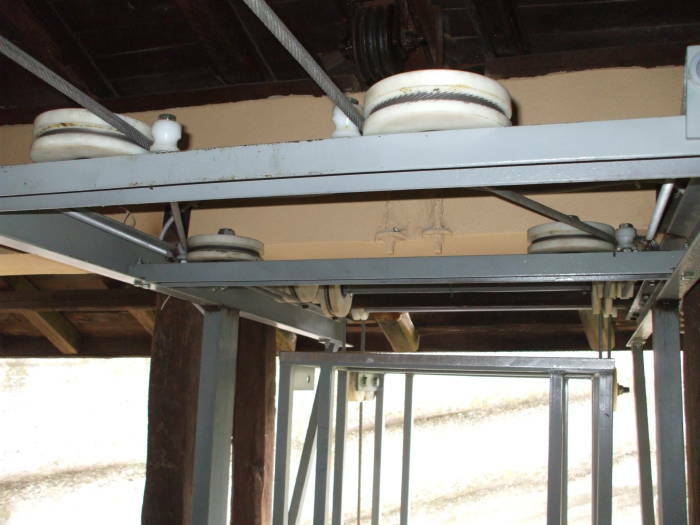 Elevator hoist motor at Moni Agiou Nikolaou Anapafsa. Elevator cage at Moni Agiou Nikolaou Anapafsa. Elevator cage and cables at Moni Agiou Nikolaou Anapafsa. Elevator cables at Moni Agiou Nikolaou Anapafsa. 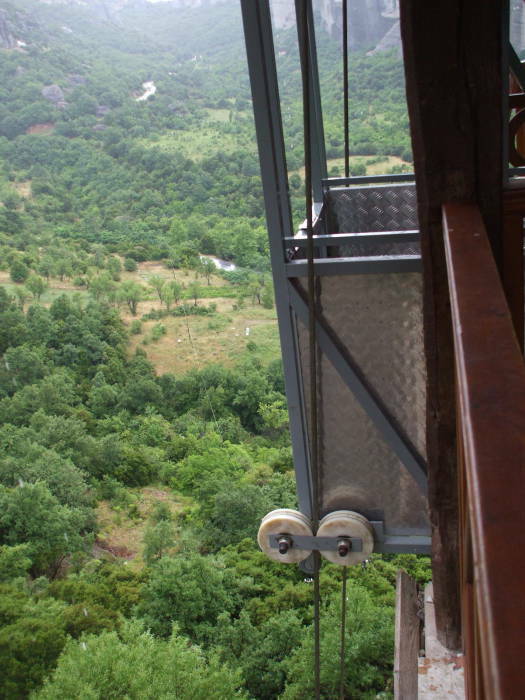 The elevator cage is suspended by sturdy cables. The elevator drops straight down to a loading area where supplies can be easily delivered to Moni Agiou Nikolaou Anapafsa. 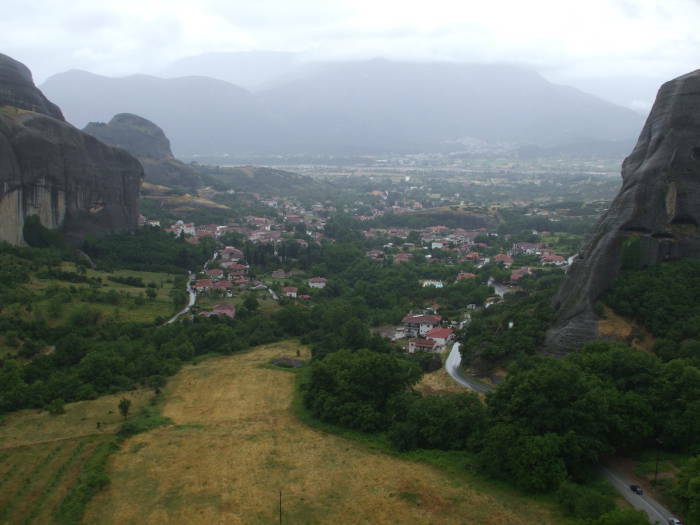 Kastraki as seen from Meteora. 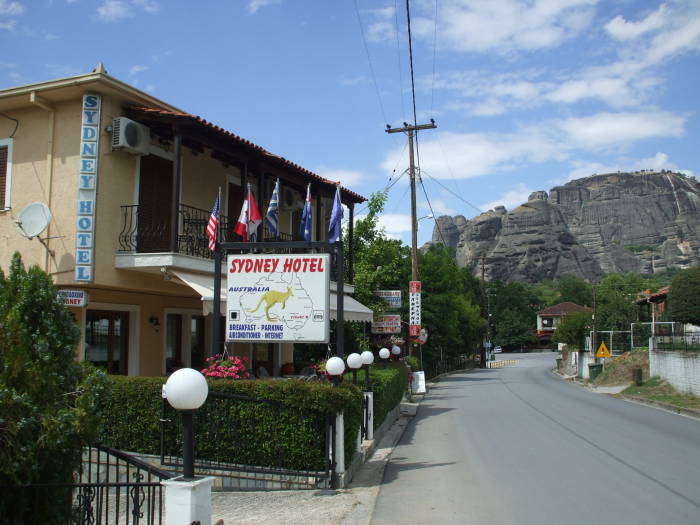 As for logistics, you can get to the Meteora area by bus or train. The train is the most pleasant way if you are traveling from Athens. The easiest of those, if you can get to Athens Larissa station on time, is train #884. It leaves Athens at 0820 and arrives at Kalampaka at 1303, having stopped in Thiva, Leivadia, Leianokladi, and Palaeofarsalos. Or, you can take one of the other trains from Athens to Palaeofarsalos, at 1051-1407, 1453-1854, and 1553-1918, and connect to trains on to Kalampaka at 1444-1531, 1922-2014, and 2004-2051. Once you arrive at the Kalampaka station, it is a walk of about one kilometer to the edge of the village of Kastraki. 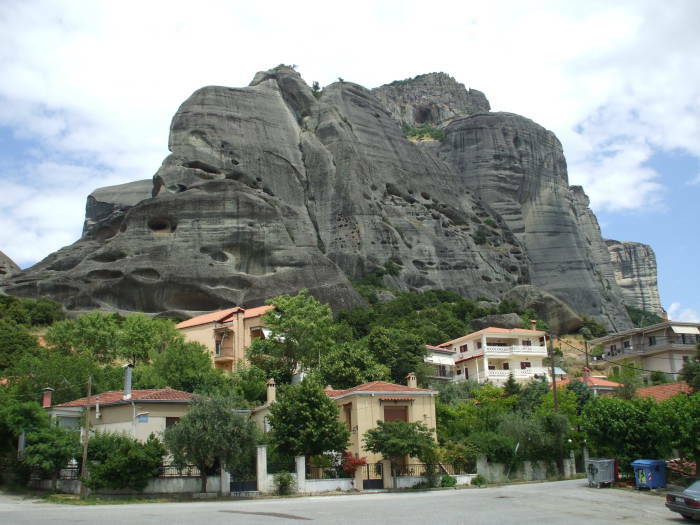 Sandstone rock pinnacles of Meteora towering over the village of Kastraki.